In 2012, a church member told Patrick about a very poor single mother with two children that needed help in Dwendwenase village. When Patrick went to seek out the family, it was very apparent that they were poorer than he imagined; the entire village was. He said that he stood out in the village because his clothes were clean. The house the family was living in was crooked, exposed and extremely dirty. The two boys, Augustine and his younger brother Appenteng did not attend school, had minimal care and were living in drastic conditions. Patrick learned that the husband had died three years previously, in 2009, and the mother was struggling to take care of them ever since. She has a sister-in-law that lives in Tema and although traditionally in Ghanaian culture the sister will look after the children of her deceased sibling, she said that times were hard and she could not take them in but would send money to support them. They aunt has sent one payment of 100GHS ($40 CND) however; she does call and has visited once to ensure they were happy. Their mother was so grateful when Patrick came and exclaimed that she had been praying for him to come for a long time. Patrick gave her money to bring the children to the orphanage herself so she could see that they would receive proper care. A week later, she arrived with Augustine and Appenteng and both have settled into life here extremely well. Augustine's mother has only visited once but Augustine has said he does not want to see her and gets emotional when talking about his parents. He is mature beyond his years and takes on a large leadership role amongst the children at the orphanage. He is very intelligent and is very good at strategy games and playing football. 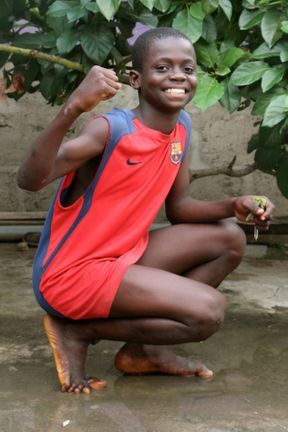 He loves playing football so much that he claims he would like to be a professional footballer when he grows up. If that doesn't work out he would like to become a pastor and maybe live in America. He is a very good dancer and is always keen to show off his rock moves to a good beat.